I am always interested in seeing a new place to hike or camp, at least new to me, and a week and a half ago as I was rambling around Meramec State Park, taking pictures and getting a feel for the place as I was thinking about my review of it, I came across a natural area that I was not previously aware of. It is called the Meramec Mosaic Natural Area, located kind of in the west-central section of the park, and it is 831 acres of bottomland forest that border the Meramec River at one end, and is somewhat cut through the center by the spring fed rippling of Beaver Creek. Now, a little information about what a “Natural Area” is. 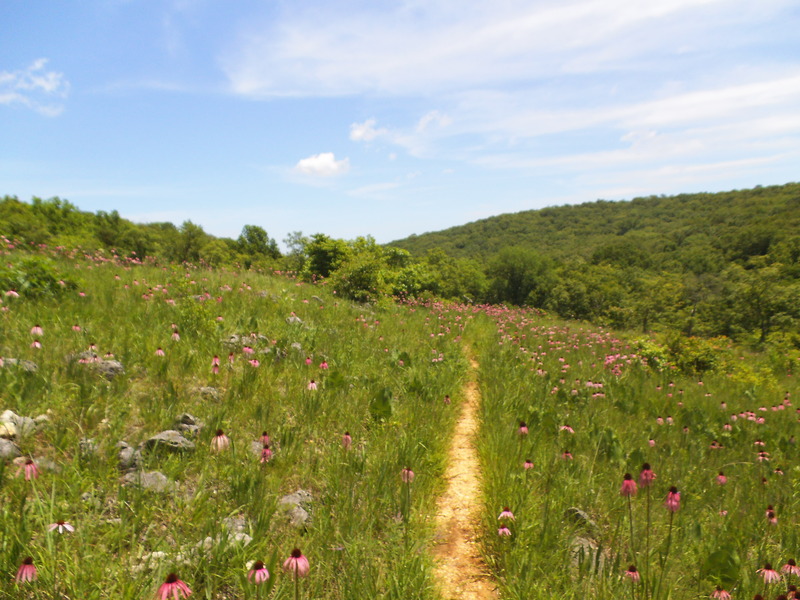 The Missouri Department of Conservation defines Natural Areas as “Missouri’s Original Landscapes”. These are places in the woods around us that are still somewhat untouched by modern progress that generally remain in the same state that they have held for decades, maybe even centuries. Forests and wetlands and prairies and caves and waterways that contain rare native plants and animals, and possibly have geological and archaeological significance. Glimpses into the flora and fauna of the landscapes that were home to the natives of the past, if home to people at all. Places where the ecological balance has been allowed to govern itself, relatively, that are preserved in order to protect the beauty and examples of nature that they possess. Or maybe I’m interjecting my own definition because I’m a fan. Anyway, a place is designated a Natural Area by the state of Missouri and protected by various organizations, including the MDC, the Missouri Department of Natural Resources, and the National Park Service. We have around 170 spots in our state that are on the list, and they include favorites like Pickle Springs, Elephant Rocks, Johnson’s Shut-Ins, and the Current and Jacks Fork rivers. The complete list can be found here. A glade, in the Meramec Upland Forest. 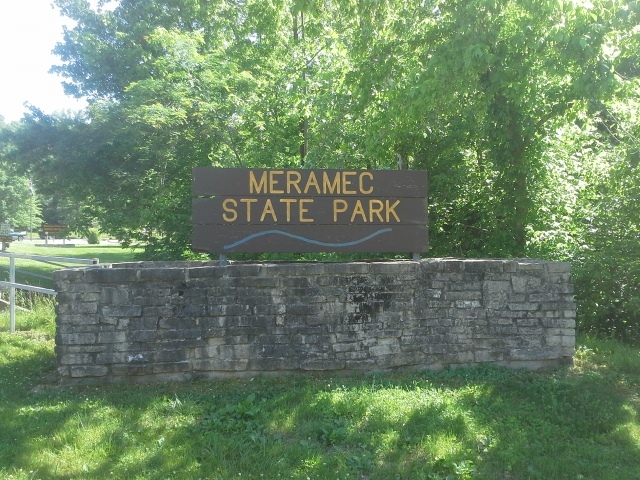 The Meramec Mosaic Natural Area is actually one of two natural areas in Meramec State Park. The other one is the Meramec Upland Forest, which is a bit more remotely located, along the northeast section of the Wilderness Trail. Back in the 1970s, the Army Corps of Engineers was in the process of damming the Meramec River at Meramec State Park in order to create a recreational impoundment, that would have created a lake where the Upper Meramec exists today. Favorite campgrounds like Ozark Outdoors and Onondaga Cave State Park would likely be under water, had this not been stopped by citizen’s groups in the late 70s. The land that had been purchased by the Army Corps from private owners in the beginning of the project was then sold to the Missouri Department of Natural Resources, which manages all our state parks. It was added to the acreage of Meramec State Park, and was designated a Missouri Natural Area in 2002. 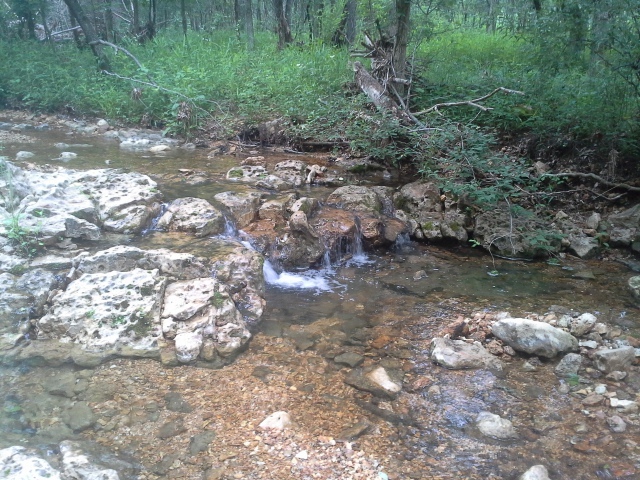 So this past Saturday, with the threat of thunderstorms on the way, a friend of mine and I loaded our dogs and day packs in the car, to head down there to see if we could find Beaver Creek, and the springs that feed into it. From the St. Louis area at the interchange of Interstate 44 and 270, take 44 west for about 50 miles, to Sullivan, MO. Get off at exit 226 and make a left (south) on MO-185, cross over 44, and continue on 185 south for about 3 miles until you reach the park entrance, which will be on your right side. After passing the Visitor Center, make a right when the road comes to a fork. The road curves around to the right, and then you want to turn left into the boat ramp area. Park in the parking lot, and the trail into the Meramec Mosaic Natural Area is unmarked but visible along the southern side of the parking lot. It must also be noted that access to this natural area is also possible along the Natural Wonders Trail, and its trailhead is located at the Visitor Center parking lot. I’m just estimating here, due to a lack of GPS and a more thorough map, but the trail is about half a mile to Beaver Creek. It traverses through some tall grassy areas, past a good sized pond, and to an old concrete bridge that crosses the creek, close to where it joins the Meramec River. It was at this point that we climbed down into the creek bed itself, thankful to get away from the ticks and chiggers residing in the underbrush. We hiked up the creek about a mile and a half, crossing here and there where the depth of the water flowing over the carved stone bottom dictated, past a section of small bluffs, and through the forest along flood plain areas and rises that opened up into glades on the hills just above us. At one point we took a break, using small trees hanging over the creek as a temporary canopy while the thunderstorm passed overhead. That is until the deluge was too much and the leaves gave way to the torrent of rain saturating the forest, and the four of us. 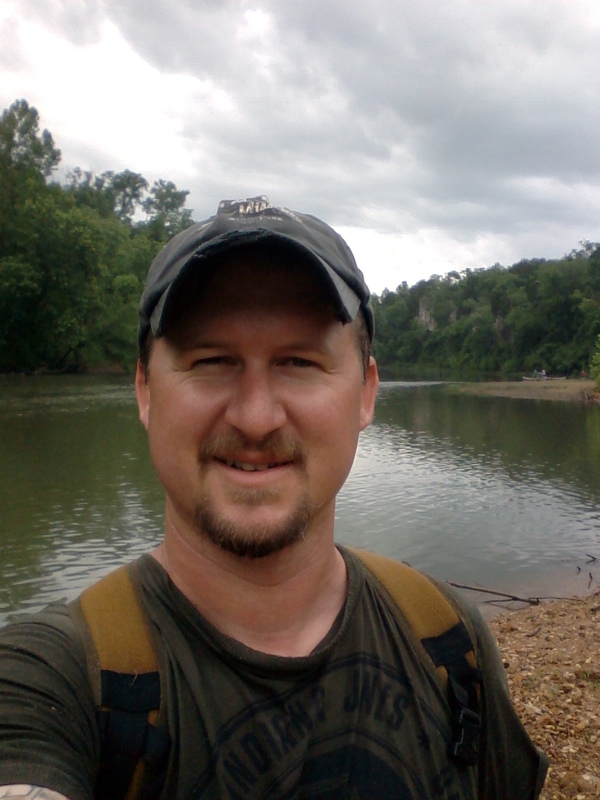 We eventually made our way back out toward the Meramec River, stopping to eat the sandwiches we packed, and give the dogs a bit of riverbank play time. Another half mile back through the forest to the parking lot, and our adventure was done for the day. One of my favorite places to hike is along Coonville Creek, on the Mooner’s Hollow Trail in St. Francois State Park. 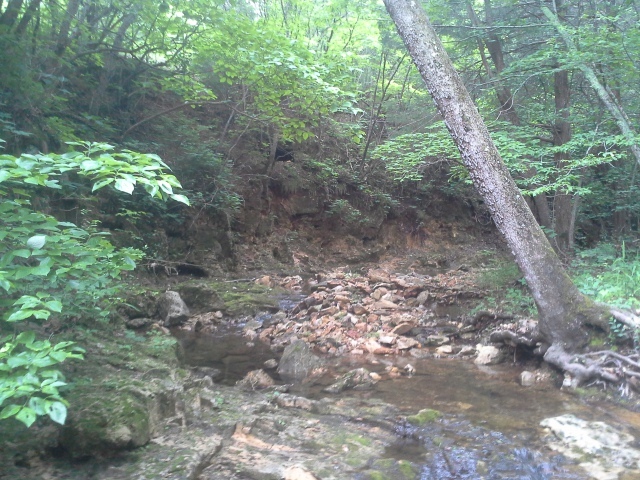 This area reminded me very much of that creek and the forest surrounding it, which is also a designated Natural Area. A little bit thicker when it came to underbrush, a little darker under the tree canopy, but a very similar place in my opinion. 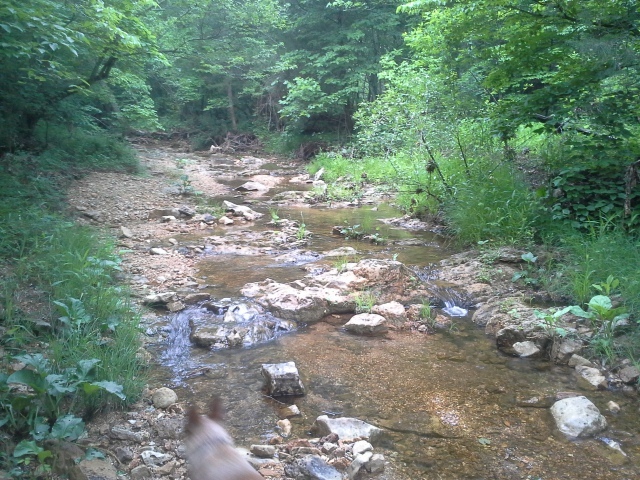 Who doesn’t like hiking along a creek?!? It reminded me of back when I was a kid, playing along creeks in some of the parks near where we lived. There is a lot of wildlife and opportunities to strengthen your connection with nature along these simple, secluded waterways. It seems very untouched, most likely due to the limited access and amount of people that spend time in this area. 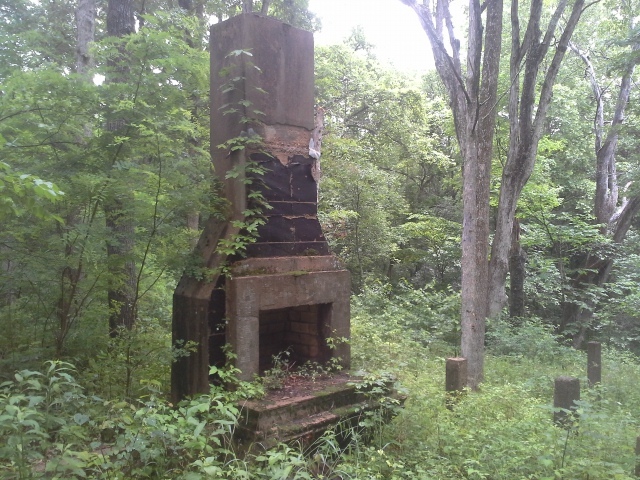 There is however, along the half mile trail to the creek, an old chimney and fireplace, along with some concrete stairs and foundation piers that must be from the people that lived there before the land was purchased for the lake project. You can even see at the top of the stairs where the driveway probably once was. 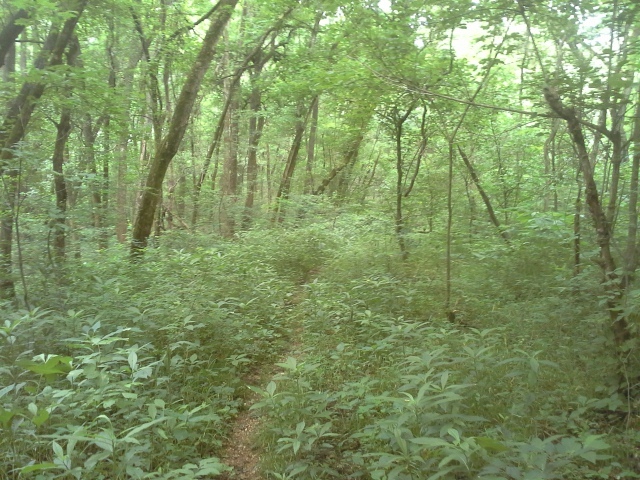 The trail is unmarked and overgrown. Do not go into this area without a compass and a map, and the knowledge of how to use them. It isn’t a huge amount of land that you couldn’t easily walk out of, but the forest can be dark and misleading, and it would be a shame to be walking in circles for hours because you couldn’t determine the direction of the sun. 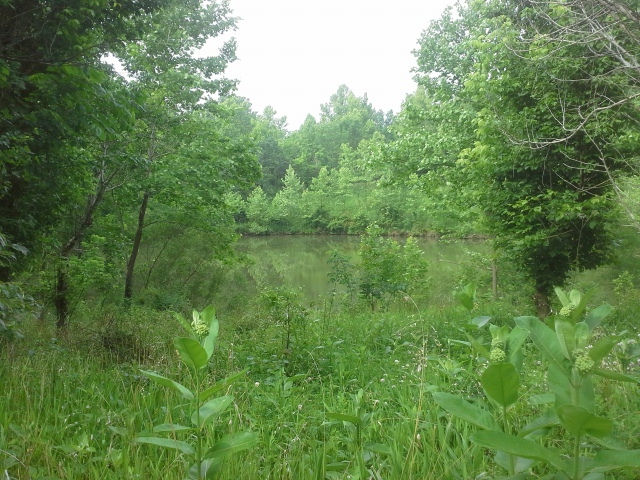 As the underbrush is overgrown on this unmarked, unofficial trail…expect ticks and chiggers. I am currently doing research on Permethrin, because even saturated in Deet, the moisture and ticks coming off of the plants as we brushed our way through there was the perfect combination for an itchy and skin crawling experience. And of course, watch out for Poison Ivy. There was something that really compelled me to want to go into this area, and I have to say that I was not disappointed at all. We got rained on and had to pick off creepy crawlies, but it is a really neat place, full of a lot of life along this creek just off in the woods. I would love to see (and even be involved with) a trail developed that would give other people a chance to experience the nature hiding back in the forest, here in the Meramec Mosaic Natural Area. 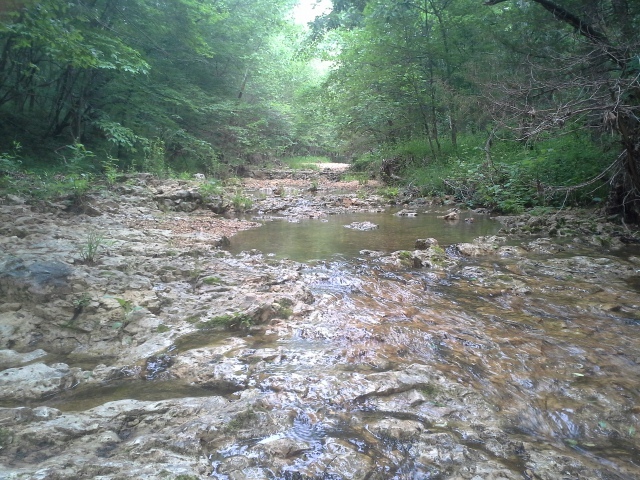 Relatively untouched for years, this is a wonderful example of a Meramec tributary, and the woods that surround it, along a river we all know and love.